A woman has won a six fold accumulator that included three away wins and three draws in the English Premier League, including a surprising tip of a draw for the match between Southampton and Chelsea at Stamford Bridge. 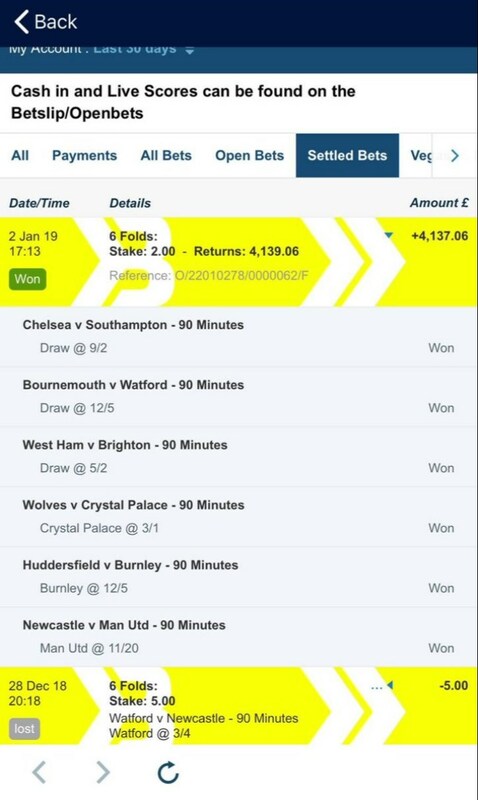 The punter had Bournemouth vs Watford and Westham vs Brighton down as a draw, she then added away wins for Crystal Palace, Burnley and Manchester United to complete the six fold accumulator. All went well with the other bets and then began the anxious wait for what seemed an unlikely outcome in the Chelsea vs Southampton match. The punter had the encounter down as draw which seemed a long shot at odds of 5.50. The match began as expected with Chelsea dominating the play and stamping their authority on the match. Eden Hazard was twice denied by Saints goalkeeper Angus Gunn and Alvaro Morata had a strike ruled out for offside as the Blues' settled fo a 0-0 draw to win the punter a handsome £4.1k from her £2 bet.